The Ford F-Series is known for a lot: reliability, durability, stability, and holding onto resale value for dear life, for decades beyond the average. But they’re typically not known for burnouts on pavement, noise complaints, or for price tags that scrape the $70,000 mark at MSRP. Unless, of course, you’re talking about the most infamous F-Series model of all time: the Ford F-150 Raptor. 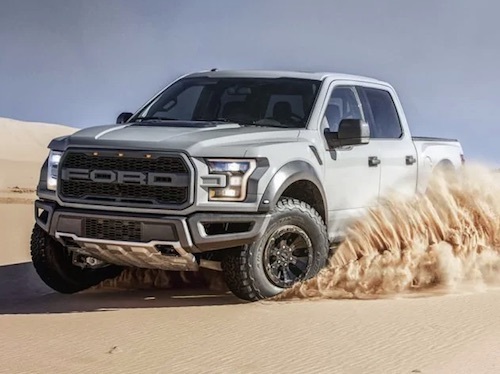 The bad-boy of the Ford truck lineup, the Raptor seems like something out of a dream for Hillsdale and Jackson drivers who are used to the quiet, stoic workhorses within the typical lineup. This is a whole new animal. 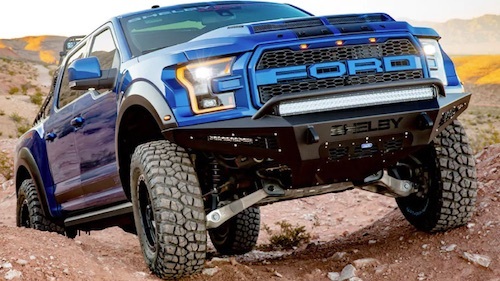 When you first take a look at the price of the Ford F-150 Raptor, you may feel a little deterred. Don’t be–because this beastly off-roading truck is worth every penny you’ll pay for it. It’s not just the most powerful, most fun, and most well-equipped truck that you’ll likely ever drive around Fremont; it’s a Ford F-Series. That means you can count on it being the most powerful and the most fun truck you’ll ever drive for a good few years to come. Unlike some luxury sports cars that peter out after half a decade, the Raptor stands strong in its performance. And what a performance it gives. Once known as the Ford F-150 SVT Raptor, this powerful truck has always boasted incredible power. But, the second-generation Raptor adopts a whole new powertrain for a whole new kind of force. The model features a Raptor-exclusive high-output twin-turbo 3.5-liter V6 EcoBoost engine, paired to a smooth and steady 10-speed automatic, that’s good for 450 horsepower and 510 pound-feet of torque. That’s even more output than the previous V-8 engine. That’s the power of EcoBoost. Chances are, if you’re shopping for a Raptor–you’re ultimately not very concerned about its MPG. But here’s the good news: because the newest F-150 Raptor trucks use EcoBoost technology, and you can see up to 18 mpg on the highway, which is right about in line with other trucks this size. That means you don’t have to pretend to feel bad as you dominate every road in Michigan. While the small-town quiet of Quincy may not inspire the average driver to seize any opportunity to find off-road trails and epic adventures, the type of drivers who chooses the Ford F-150 Raptor is far from average. That’s why the new Raptor is built with tons of incredible all-terrain and off-road equipment to hold its own on just about any surface. 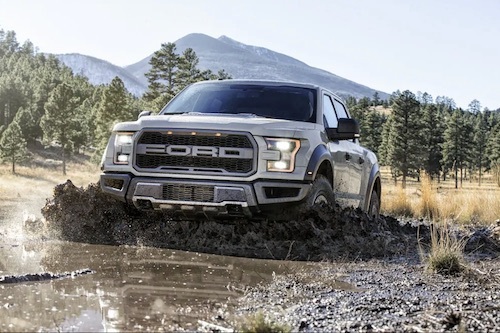 The F-150 Raptor features a fully boxed frame, and a front axle with TORSEN® differential and Electronic-Locking Rear Differential. A long-travel suspension with 3.0-inch FOX Racing Shox gives the Raptor a surprisingly smooth ride, even on the roughest roads and most challenging surfaces. As you can imagine, 4WD comes standard on the Raptor to provide excellent grip and traction. Only 500 of these beauties were ever produced–and their sticker price started at a mere $117,460–so don’t be too surprised if this is the first time you’re hearing about it. This special-edition truck got the full Shelby treatment with a distinctive Baja flair, including bold exterior treatments, a tough rear rack bolted to the bed, and enhancements to the suspension and power. It increases output to an incredible 525+ horsepower and 610 pound-feet of torque. If you can’t buy a Ford Shelby Raptor near you, or if you already own a Raptor, Ford will allow you to purchase a conversion upgrade, for a little under $50,000. For what you get–we think that’s a bargain. You can’t find muscle like this anymore. The very shape of the Ford Raptor is legendary, and whether you choose the SuperCab or SuperCrew style, you’re getting iconic design in every square inch. From the classic Ford F-150 Raptor grille, with in-your-face block letters and clever integrated marker lights, to its dual exhaust with dual tailpipes in the back, it’s impossible not to stand out in Jackson. The overall design of the Raptor is very Ford, and classic F-Series. A handsome shape, big wheel arches, and logical angles. It’s a recipe that works. But the Raptor treatment that Ford gives the F-150 is like adding Sriracha, chili flakes, and ghost peppers to the recipe. The angry snarl scrawled across the front fascia says it all, and anything left to be said is taken care of by a set of 17-inch cast aluminum wheels with hefty all-terrain tires. Who says that an ultra-rugged, ultra-capable truck can’t also be comfortable? Certainly not Ford. The F-150 Raptor comes standard with deep, supportive bucket seats and power movement; exclusive Raptor detailing can be found throughout the cabin. Options like perforated leather-trimmed upholstery, heated and ventilated seats, heated steering wheel, and driver memory seat functions let you add increasing levels of luxury to your Raptor’s interior. The new Ford Raptor is tech-savvy, too. It comes standard with SYNC and AppLink, and you can easily upgrade to Ford’s class-leading SYNC 3 system, one of the most innovative and intuitive infotainment systems on the market. Premium Audio, Navigation, ambient lighting, and a huge suite of safety and security features can all be added via package options. Contact Stillwell Ford for more info about Raptor package options.